Economic theory and methods applied to environmental problems and policies. Policies affecting individual and business decisions about environmental quality, policy formation, and incentive-based solutions. 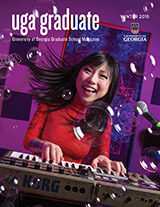 Graduate study is offered at both the masters and doctoral levels. The Master of Science (MS) in agricultural economics and the Master of Science (MS) in environmental economics degrees require 27 hours minimum of course work and three hours of thesis. A Master of Agricultural Economics (MAE) degree consists of a minimum of 36 hours of course work including a technical report in lieu of a formal thesis. The Doctor of Philosophy (PhD) degree consists of a minimum of 63 hours of course work beyond the bachelor’s degree, satisfactory performance on written and oral examinations, and a formal dissertation.